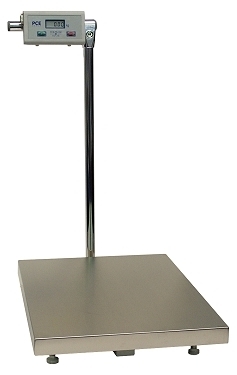 The PCE-PS is a multipurpose industrial platform scale. This industrial platform scale displays the measuring unit in kilograms (kg) to provide accurate weighing results (legal for trade) at an affordable price. The indicator cable is 1.5 m and the indicator can be placed on your table or desk or can be fixed on the pillar (pole). A wall mounting bracket is attached to the scale as standard. This platform scale can be used for different purposes. Whether it is a QC application, packaging or just general weighing when you compare the specifications of this scale, nothing comes close to the price and quality PCE offers. The PS Series is legal for trade so it will meet weighing and measuring requirement of M Class III class. The indicator features a display for easy viewing of weighing results along with an interface for connection to a PC. The optional software-kit allows to transfer data to the PC. This link shows an overview of the scales and balances which will meet your requirements. The verification procedure includes laboratory calibration process and certification according to the rules (legal for trade) of legislation/verification in Germany (based on the customer's postal code). The customer's name and address are included. They are accepted all over the world. In case your PC or Portable uses USB Interface, you can use the adapter together with the standard RS - 232 Cable. Software (covering the actual drivers) is included.